Cauliflower is growing in popularity in the United States. With the low-carb movement, people are discovering ingenious new ways to prepare this vegetable that our grandmothers would never have dreamed of! In the video below, I cover a lot of basic information about this interesting cruciferous vegetable, from what it is, to nutritional aspects, to how to prepare it and what foods and flavorings go well with it. To see my notes, please look below the video. Enjoy! Cauliflower is a member of the cruciferous vegetable family, so it is related to cabbage, kale, Brussels sprouts, broccoli, and other such vegetables. There are many different types of cauliflower, including different colors in orange, green and purple. 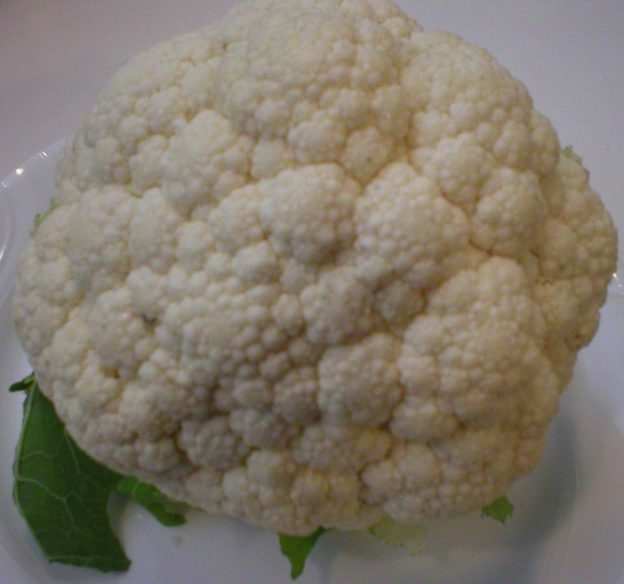 In the United States, most cauliflower sold is white with a fairly large compact head (or “curd”) with undeveloped flower buds that resemble broccoli florets. The history of cauliflower dates back about 2,000 years. It appears to have originated in the area of modern day Turkey. Many cultures prefer a loose curd variety of cauliflower over the tight compact head type often seen in our grocery stores. Cauliflower is more popular in other parts of the world than in America, although popularity is increasing with the new ways of preparing it with the “low carb” trend. China and India produce 74% of the world’s cauliflower. Like other vegetables in the cruciferous family, cauliflower is low in calories and high in specific nutrients. One cup of raw cauliflower has only 25 calories, 3 grams of fiber, 77% of the RDI for Vitamin C, 20% of the RDI for Vitamin K, and notable amounts of some B vitamins and potassium, manganese, magnesium, and phosphorus. Also like other members of the cruciferous family, cauliflower is high in antioxidants that help to boost our immunity, reduce inflammation, and help to protect against cancer and heart disease. Cauliflower also is one of the plant foods (along with its cousin broccoli) that contains choline, a compound that protects our nervous system and helps ward off dementia and Alzheimer’s disease. Many people who are following low carbohydrate diets are now using cauliflower in ingenious ways to create interesting food alternatives such as cauliflower rice, pizza crust, hummus, tortillas, and mashed in place of potatoes. Look for cauliflower with a clean, firm, compact head that is creamy white in color. It should feel heavy for its size. Avoid those that are soft, have brown areas, or dark spots on the curds. Those with more leaves will usually be fresher. Store uncooked cauliflower in a plastic bag in the refrigerator. Place it stem side down to protect the florets from excessive moisture. It will usually keep well in the refrigerator for 3 to 5 days. Fresh cauliflower can be frozen, fermented, pickled, and dehydrated. Dehydrated cauliflower: There is mixed information available on how and even whether cauliflower should be dehydrated. Some sources say it doesn’t need to be blanched; however, when you read the “fine print” they do state that it will darken after being dried if not blanched. Others state it should be blanched first, which I agree with, since blanching will stop the enzyme activity that will continue the aging process even after being dried. Follow your dehydrator manufacturer’s instructions on how to dry cauliflower in your machine. Cauliflower is available in most grocery stores both fresh and frozen. Fresh cauliflower is obviously more versatile than frozen, since it can be used both raw and cooked. Frozen cauliflower is a great convenience since it’s already washed, cut up and blanched. It will only be suitable for use in cooked dishes, but since it’s already blanched, it will require very little cooking time. Overcooking frozen cauliflower will make it soggy and mushy, so cook it quickly with as little water as possible (if you’re using water). The simplest way to wash cauliflower is to cut or break it into desired size pieces, then wash it. First, remove the leaves then remove the florets by cutting the central stem out where it meets the floret stalks. The florets can easily be removed and cut down or broken into smaller pieces, if desired. If you are making cauliflower “steaks” then simply cut through the entire head into the desired width of slices needed for your recipe. The leaves and any undesired stem pieces can easily be removed after slicing. Submerge the pieces into a bowl of water to rinse away any dirt or tiny insects that may be in there. It would be unusual to find insects in grocery store-purchased cauliflower. However, if the cauliflower was picked from your garden or bought at a farmer’s market, insects may be among the florets. In this case, soak your prepared pieces for 15 minutes in a bowl of salt water or a bowl of water with either lemon juice or vinegar mixed in. This will kill any insects that are lurking inside and also helps to remove any trapped dirt. After soaking, rinse the cauliflower well in fresh water, then proceed with your recipe. Most people just eat the cauliflower florets. However, the stems and leaves are also edible, so include them if you want to enjoy the full benefit of the vegetable. Some people reserve the leaves and stems for soups or vegetable stock. If you are opting to cook the cauliflower whole, then submerge the entire head for 15 minutes in a bowl of water, or one with salt or vinegar added, depending on where it was purchased. Rinse it well under running water afterward. How is it usually eaten…raw or cooked? Although cauliflower is edible both raw and cooked, it seems that Americans enjoy this vegetable cooked more than raw. Roasting has been the latest favorite way to prepare cauliflower. Like broccoli, cauliflower contains sulfur compounds that can be released with extended cooking. To prevent that strong sulfur odor and flavor, cook cauliflower quickly and with as little water as possible. This will also help to retain its crispness. Cauliflower can be boiled, steamed, roasted in bite-size pieces or steaks, sautéed, stir-fried, made into soups, crumbled into rice, mashed like potatoes, braised, added to stews, battered and fried, added to casseroles, baked into mock bagels, breads and muffins, and served raw in salads. •	Top hot cooked cauliflower with melted butter and season with your choice of chives, dill, nutmeg, minced parsley, or lemon juice for a delicious side dish. •	Try roasting it with a drizzle of olive oil and your favorite seasonings. Nuts pair nicely with cauliflower and can be roasted alongside the florets, if desired. Toss together in a bowl before serving. •	Raw cauliflower is delicious on a crudité platter and makes a crunchy addition to seasonal salads. •	Add chopped cooked cauliflower to a quiche, or stir it into scrambled eggs. •	Roast cauliflower and broccoli together, tossed with garam masala and olive oil. •	Cauliflower can be used to create kid-friendly dishes thanks to its ability to take on the flavors and seasonings of a recipe. •	Cut down on the carb content of decadent dishes like pizza and pasta by replacing the flour, grain or glutinous component with cauliflower. •	Bring classic Indian flavors to the table with a cauliflower aloo gobi. This entry was posted in Food and tagged About Cauliflower, Cauliflower 101 The Basics, Herbs spices that go with cauliflower, How to buy cauliflower, How to prepare cauliflower, How to store cauliflower, What foods to with cauliflower on April 4, 2019 by Judi.